Arizonans will get to decide in November whether to hike the state’s minimum wage to $12 an hour by 2020. Opponents of a voter initiative raising the state's minimum wage from $8.05 to $12 an hour by 2020 on Wednesday asked the Arizona Supreme Court to overrule a trial judge's decision that said they filed their challenge too late. 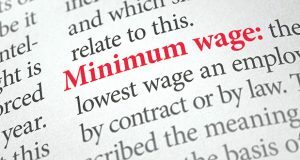 Foes of an initiative to hike the minimum wage to $12 an hour have no legal right to challenge whether the signatures were gathered by people who were not qualified, Maricopa County Superior Court Judge Joshua Rogers ruled today. A bid to get a public vote to hike the state’s minimum wage is now facing a new hurdle. The fate of whether voters get to decide two ballot measures dealing with wages could depend on who shows up in court. For the first time in 74 years, and only the sixth time in history, Arizona’s general election ballot won’t have a single proposition referred by the Legislature. The Campaign to Regulate Marijuana like Alcohol has claimed that money for its ballot measure to legalize recreational pot wasn’t just coming from weed-related businesses. If you need signatures collected for a citizen initiative in Arizona, there’s a good chance you’re paying Andrew Chavez to get them.